UPDATE (Jan. 18): Lance Armstrong admits to using performance enhancing drugs in an interview with Oprah Winfrey. Read More. Find Week 3 at the Tour: This blog post covers the first two weeks of the 2012 Tour de France. Find results from the final week and all stages of the Tour right here. Andre Greipel won a photo-finish sprint to win Stage 13 of the Tour de France, his third stage victory of this Tour, while Britain’s Bradley Wiggins retained the overall lead. The mostly flat stage had one major climb, which Greipel managed to assault with the rest of the leaders. Other top sprinters, including Mark Cavendish, were unable to keep up over the climb and did not factor in the finish. The overall standings remain the same: Bradley Wiggins, Chris Froome and Vincenzo Nabali top the podium. Learn more at the Tour de France website, including the overall standings. Stage 12: David Millar won his second stage ever at the Tour as part of a 5-rider breakout that stayed away for more than 130 miles. Read more. Stage 11: Bradley Wiggins moved closer toward becoming the first Briton to win the Tour de France when he survived the toughest climbing stage to extend his lead, while Cadel Evans cracked on the final climb and fell to fourth. Read more. Stage 10: Briton Bradley Wiggins survived a day of climbing and kept the yellow jersey as Thomas Voeckler won the stage, followed by Michele Scarponi and Jens Voigt. Read about the stage. Stage 9: Race leader Bradley Wiggins blitzed the field to win Stage 9, a 41.5km time trial, and put some serious time into his rivals. Wiggins explained why he’s a natural at time trials. Stage 8: Bradley Wiggins performed well in Stage 8, won by Frenchman Thibaut Pinot, to retain his overall lead. Stage 7: The real race begins as Bradley Wiggins takes possession of the overall lead after a climbing finish creates separation among the riders. Defending champion Cadel Evans finished third. More. Stage 6: A large crash again dominated the news in Stage 6, causing several abandonments, while Peter Sagan won his third stage in this tour by besting Andre Greipel, winner of the previous two stages. Read more. Stage 5: Andre Greipel again out-sprints the field for a win, besting his rival Mark Cavendish. Stage 4: Andre Greipel dodged a significant crash, which claimed Mark Cavendish, near the end of the stage and then sprinted to victory. Stage 3: First-timer Peter Sagan of Liquigas-Cannondale captured Stage 3 with a convincing win in the final sprint to claim his second stage win. Stage 2: Here’s how Mark Cavendish surged to win his 21st stage on the Tour. More. LAST YEAR: The Tour de France in 2011 saw Cadel Evans claim victory with a late, stirring time-trial win. Andy (2nd) and Frank Schleck (3rd) became the first brothers to grace the podium together. Sammy Sanchez was King of the Mountains, Mark Cavendish earned the green jersey for most points, Pierre Rolland won the best young rider competition and Team Garmin-Cervelo was tops among teams. Swany Gloves is dedicated to bringing you the best of outdoor adventure. Like us on Facebook, follow us on Twitter for updates on the Tour and more adventures. Find Week 3 at the Tour: This blog post covers the first week of the 2012 Tour de France. Find results from the final week and all stages of the Tour right here. Don’t be fooled by the fact that this was Stage 7: The real race began on Saturday when Bradley Wiggins took possession of the overall lead in the Tour de France after a climbing finish began to create separation among the riders. Team Sky teammate Chris Froome led Wiggins up the final climb before breaking away for the stage win. However, defending champion Cadel Evans showed his mettle, staying with the pair to finish third. More. The overall standings now show Wiggins in the lead with Evans 10 seconds back and Vincenzo Nabali 16 seconds off the lead. Previous leader Fabian Cancellarra rode well, but could not keep pace and now stands 11th, 1:43 off the lead. Read more at the Tour de France website, including the overall standings. UPDATE: Race organizers, aiming to correct a big gap in last year’s TV coverage when viewers were left in the dark, have created a plan to ensure coverage of the thrilling downhill on Independendence Pass into Aspen. Read how. Last year’s inaugural USA Pro Cycling Challenge was a huge success, with more than a million people coming out to attend the return of professional bicycling to Colorado. The week-long stage race was a thriller, with breathtaking (literally) climbs and multiple leaders. When all was said and done, Levi Leipheimer won the closely-contested race over Christian VandeVelde and Tejay van Garderen. Other superstars like Tour de France champ Cadel Evans , Andy Schleck (and brother Frank) also came to Colorado. So it’s no surprise that excitement is high for the second edition of the race in August. Organizers previously released the name of host cities, and now they’ve released the actual routes, which includes multiple mountain-top finishes as well as a time trial on the final day. See the routes. Swany Gloves is dedicated to bringing you the best of outdoor adventure. Like us on Facebook, follow us on Twitter. 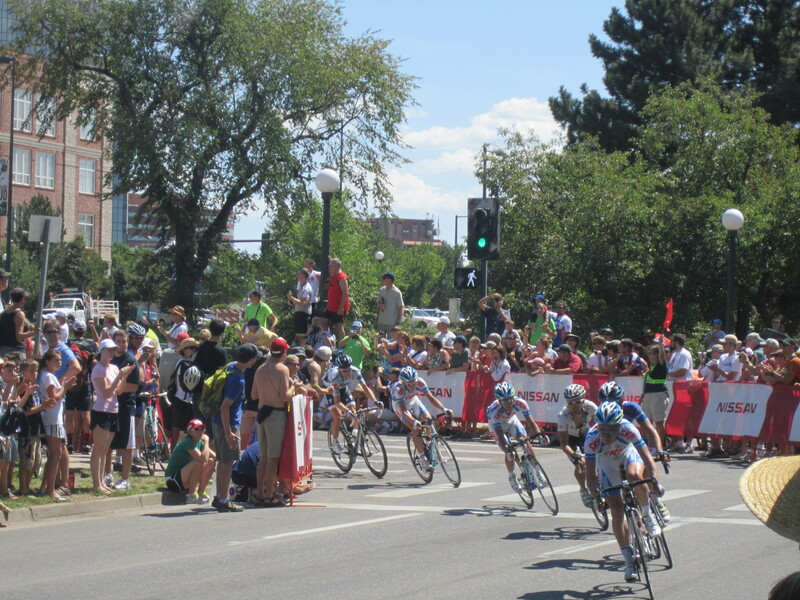 The peleton spins out of a turn at the USA Pro Cycling Challenge during the final stage in Denver. Levi Leipheimer won the inaugural USA Pro Cycling Challenge, which concluded Sunday. But the bike-crazy fans of Colorado felt like winners as well, flocking in large crowds to each stage, with as many as 250,000 coming on the final day in Denver. What was the scene like? Check out this “homemade” video to hear and see the excitement at a turn on the course. Monday’s Prologue saw a surprise winner in Colorado Springs. Stage 1: American Levi Leipheimer found the strength to sprint to the win on the final climb. Stage 2: Veteran George Hincapie rides to a surprising stage win while Tejay Van Garderen takes the yellow jersey. Vail Time Trial: A record run by Levi Leipheimer by the American regains the yellow jersey. Stage 4: Elia Viviani wins the stage in a sprint finish in Steamboat Springs. Stage 5: It’s not a mistake, Elia Viviani won AGAIN in a sprint finish in Breckenridge. 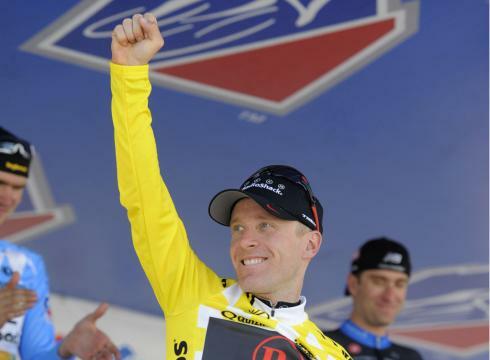 Stage 6: The peleton ran down all the breakaways as Levi Leipheimer rode to victory in Denver. Complete stage and overall standings here. Swany Gloves is dedicated to bringing you the best of outdoor adventure. Like us on Facebook, follow us on Twitter for updates on more adventures. Denver — Perhaps we should have figured a Montana native by the name of Levi would tame the Colorado high country and win the inaugural USA Pro Cycling Challenge. But it took a lot more than a birthplace for Levi Leipheimer to win, starting with his record run in the time trial on Wednesday on Vail. And surprisingly, after several days of the yellow jersey moving from rider to rider, the final four days produced no changes in the order of finish or the time gaps. Which didn’t make Sunday’s final ride into Denver any less entertaining than the rest of the race, producing several breakaways in front of a huge crowd, estimated at 250,000, to watch this 518-mile race come to an end. And while Elia Viviani, who had won previous sprint finishes in Steamboat Springs and Breckenridge, could have won on Sunday, he worked to help his teammate, Daniel Oss, win instead. And when it was over, Leipheimer hung on for the win, followed by Christian VandeVelde (:11 back), Teejay VanGarderen (:17), Tom Danielson (:21) and veteran George Hincapie (:53) to give Americans a sweep of the race’s top five spots. Tour de France champion Cadel Evans acquited himself well, finishing seventh (1:18 back), but things didn’t go as well for his podium mates from the tour, Frank Schleck (13th, 2:17 back) and his brother Andy (33rd, 6:65). Find complete stage and overall standings here. Stage 2: Veteran George Hincapie rides to a surprising stage win while Teejay Van Garderen takes the yellow jersey. WATCH ONLINE: Catch a live stream of every stage on Shack Tracker. The quality is good and standings are updated dynamically on the page. Watch here starting at noon Mountain time on NBC to see Sunday’s 73-mile ride from Golden to Denver. Breckenridge — It’s not an instant replay: Italian Elia Viviani of Team Liquigas-Cannondale was again the winner in Saturday’s stage of the USA Pro Cycling Challenge. The peleton tracked down a heroic breakaway that included Andy Schleck in the final kilometer, leading to Viviani’s second straight win. As a result, the overall standings unchanged, which means Sunday”s ride may well be a victory lap for current leader Levi Leipheimer. Find complete stage and overall standings here. And now it’s on to the final stage, a 73-mile stage race from Golden to Denver. Stage 3: Elia Viviani wins the stage in a sprint finish in Steamboat Springs. WATCH ONLINE: Catch a live stream of every stage on Shack Tracker. The quality is good and standings are updated dynamically on the page. Watch here starting at 2 p.m. Mountain time to see Saturday’s Stage 5 ride from Steamboat Springs to Breckenridge. Steamboat Springs — You didn’t think every day of the USA Pro Cycling Challenge was going to be wild, did you? After seeing someone different in the yellow jersey four of the first five days, Friday’s race from Avon to Steamboat was mostly a group affair, with Italian Elia Viviani of Team Liquigas-Cannondale winning in a sprint finish while all the big names finished with the same time, leaving the overall standings unchanged. That means Levi Leipheimer will remain in the lead, followed by Christian VandeVelde, Tejay Van Garderen, Tom Danielson and George Hincapie to round out the top five. Tour de France champion Cadel Evans remained 7th, with Frank Schleck in 13th while brother Andy Schleck, who fell out of the competition after Tuesday’s Stage 2, in 39th. And now it’s on to Stage 5, an 105.2 mile stage race from Steamboat Springs to Breckenridge.